The Greek-Melkite Catholic Patriarchate was attacked in Haret Al Zeitoun and a Latin parish in Bab Touma. Dozens of shells fell in a few hours. AsiaNews source deny rumors of Christian victims circulated in these hours. On January 21st, a new round of UN talks begins in Geneva. 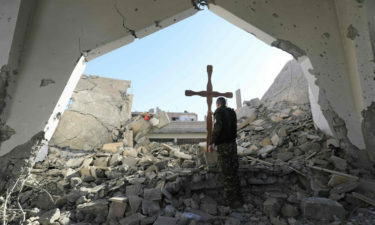 Damascus (AsiaNews) – Mortar rockets launched from the territories controlled by Syrian rebels hit the Christian neighborhoods of Damascus in recent days, causing injuries and material damage. The shells hit the Greek-Melkite Catholic Patriarchate (in the photos), in the district of Haret Al Zeitoun, and the Latin parish of the Conversion of St. Paul, in Bab Touma. An AsiaNews source in the capital, speaking on condition of anonymity, instead denies the news circulated on online of possible victims among the faithful of the community. Yesterday a shell hit the seat of the Greek-Melkite patriarchate, causing some damage to the structure. In the area, up to 30 mortar rounds fell in a few hours, concentrated in particular in the old city of Damascus and in the (mostly Christian) neighborhoods of Bab Touma, Bab Sharki and Qassa'a. The day before a mortar reached the district of Bar Touma, in the old city, where there are several churches and Christian buildings. The Latin Church of the Conversion of St. Paul, under the custody of the Franciscans, was hit. The blast also caused some damage to the nearby Maronite cathedral. The attacks are part of the climate of tension building in the rebel enclave of Goutha East, on the outskirts of the capital. The AsiaNews source reports that "the attacks on Christian neighborhoods have caused several injuries", but at the moment "there are no victims". There is, however, "massive damage" to "structures, from the houses of the religious to the ecclesiastical offices". These are "mortar shots that are launched without a specific goal" but that in these last days "have concentrated in the areas with a Christian majority". There does not appear to be "a particular project to target Christians, rather to feed tension" after a long period of "relative calm". "This happens - concludes the source - when negotiations intensify or in conjunction with meetings and dialogue between the parties at international level". Meanwhile, the front of international diplomacy also moves, in an attempt - so far in vain - to put an end to a conflict that broke out in March 2011 and which has caused hundreds of thousands of victims, including civilians, and millions of displaced persons. Next January 21, a new round of peace talks is scheduled under the auspices of the United Nations in Geneva, Switzerland. According to reports from the opposition chief negotiator Nasr Hariri, the meeting should last at least three days and intends to return to the UN – overshadowed by the Astana talks - a central political role in the attempt to end the conflict. At the end of January, a round of negotiations sponsored by Russia in Sochi, on the Black Sea, is planned; however, in this case the oppositions front reveals it has "not received " any formal invitation. "We do not know - added Hariri - what the real goal" of Moscow is; to date there are no official decisions about the presence or absence of the anti-Assad front at the meeting. The Syrian opposition is currently looking to the UN peace summit in Geneva, following last week's meetings in New York with Secretary General Antonio Guterres and Deputy Secretary-General for Political Affairs Jeffrey Feltman. At the meeting the rebel front will present itself "without any initial precondition", confirms Hariri, because "there are no alternatives to Geneva" even if, to date, no real progress has been made.